AppyVent - Free wedding website, app and guest photo sharing. Plan, communicate and engage with your wedding guests in a way they will never forget. Your wedding journey begins long before your big day and forever after with your own wedding social network app. Never miss a moment of your special day and journey. We know you can't be everywhere at the same time. Lets your guests capture all the moments, from all angels on their phones and share them to your wedding albums. A digital invitation of your wedding for your guests. RSVPs, map & directions, online registry, events, accommodations, agenda, times and much more. Send SMS and email RSVP requests or have your guests RSVP in your wedding website and app. Track sent RSVP requests, manage guests and create seating charts in minutes with our easy to use drag & drop seating planner. Message guests and share the moments and photos from your journey. Encourage your loved ones to share their photos and give your guests a live, real-life experience on the way to your big day! Have all your guests capture all the photos and moments you might have missed otherwise. Guests can capture photos live or upload photos taken from their device gallery with a click of a button. Broadcast guest photos live and encourage other guests to share photos and upload their own. SMS reminders on the day of your wedding. Send each guest his table/seating ID, directions and instructions how to upload and share their own photos. Thank your guests by SMS or email and send them instruction how to upload photos from their mobile devices or computers. Turn your guest photos to amazing, memorable video clips you can create in minutes and share with all your guests. All photos are yours. You can download all photos in high-resolution for your own use. We'll keep them hosted on our servers so you can always go back in time to all the special moments. You want to capture all the moments of your special day but can't be everywhere at the same time. You care about the environment and want your guests to have a digital version of your invitation. 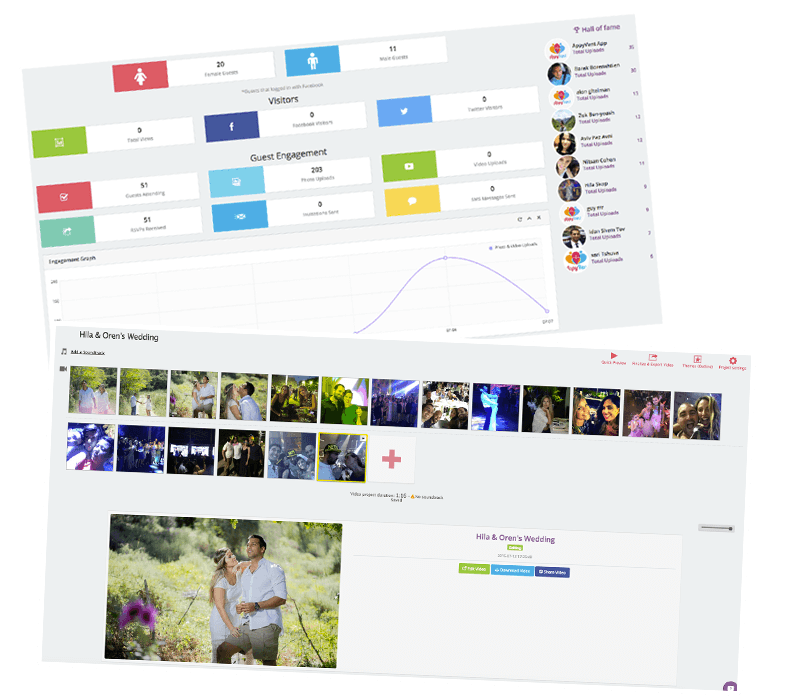 You need easy-to-use tools to plan your wedding and manage your guests on-the-go. You want a wedding website you can be proud of and show-off. There's a reason you haven't invited ALL your Facebook friends. You want to get your RSVPs done in minutes, not days. You want your guests to talk about how amazing your wedding has been. An all-in-one wedding experience for you and your guests. Your own unique wedding app and website for you and your guests. This is your private social network for your wedding and where all the magick happens. Send SMS, email and Push notifications to your guests in real-time. Track messages sent and who viewed. Never worry about last minute changes. Never miss a moment. Capture hundreds of photos and angles you would have otherwise missed. Make your guests your photographers. Create an album for each event. Help us save the trees and send your online wedding invitations and RSVPs. Get Instant replies from your guests by SMS RSVPs. It's never been easier and faster to collect RSVPs. Have you ever thought it could be fun? Let us show you how. Use our drag & drop seating chart planner to manage your guests seating arrangements. You can event send them an SMS with their seating ID! Your guests need a place to stay. Let them know what's nearby and what they can do around. All your wedding events in one place. Manage guest lists and collect RSVPs for each event. Make events visible to specific guests and create a dedicated event album. It's so easy! Have a live feed of your wedding guests photos on the big screens. You can pick from specific albums and even have multiple screens showing different albums. How cool is that?! Surprise your guests with video clips created on the fly with their own photos. Our video editor makes it super easy to create amazing videos from your event photos or new photos you uploaded. Add your spouse, mom, dad, sister or your best friend as an admin to your wedding and let them help you plan your wedding as a team. Your wedding URL is already short and memorable - weddingid.appyvent.com. Pick your own sub domain or use your own domain for your wedding website and app. All your registries displayed in a beautiful way in your wedding app and website. Add shops from our list or create a custom wedding registry. We've celebrated weddings with couples and their guests all around the world. Read for yourself what they have to say about us. Thank you AppyVent for creating an awesome experience for our guests, they loved it! We've managed to get all RSVPs within 2 hours after we sent them out. Out guests were amazed by our wedding app and website. We HIGHLY recommend! Our guests LOVED the live broadcast during the event! It was funny to see all their photos on a big screen while everyone were eating. We've managed to collect over 300 photos from our guests and quite a few of them were actually amongst the best photos of our wedding. Thank you AppyVent! What is AppyVent and why should I use it? AppyVent is a unique, private social network for your event. It's the place to engage and connect with your guests in a way they will never forget. We provide you with all the necessary planning tools to make your event journey slick and smooth. We also provide you with an app and a website for your event where guests can join and share special moments and photos they captures. AppyVent is an all-in-one platform that saves you money, time and energy and delivers an unforgettable experience for you and your guests. We offer plans for private, non-profit and professional events. More information can be found in our "Pricing" page. What happens if someone uploads an inappropriate photo? You can assign "event moderators" that will receive a push notification everytime a photo is uploaded and will need to approve/reject the photo before it's uploaded to your event albums. Every photo can be flagged as "inappropriate" directly from the app. All event moderators will also get a push notification for their approval. You can disable/enable automatic uploads or have photos approved manually before their shared to the rest of the guests. Photos can be managed in real-time in your event dashboard. You can delete, reject and approve photos directly from the dashboard. In case you need real-time human photo filtering, pelase contact us at [email protected] We offer live human filtering during your events if all the above is not enough for you. How does the SMS RSVP work? Do guests need smartphones? No. Your guests and attendees don't need a smartphone to reply to a SMS RSVP. With a click of a button you can send SMS RSVP request to all your guests. Within minutes you'll start getting all the responses directly to your event dashboard. SMS will be sent from a local number in your country and guests will be replying to a local country. There are no extra or international charges to your guests. The only cost is 1 SMS credit per guest. Each SMS can contain up to 180 characters and you can use our pre-defined messages or enter your own custom message. What kind of events can I use AppyVent for? You can use AppyVent for ANY event. Whether it's your birthday, wedding, friend's surprise party, a group trip, a company event or a family gathering - AppyVent will upgrade any event, guaranteed! How will my guests know to use AppyVent at the event? Are there any limits/hidden fees? No. 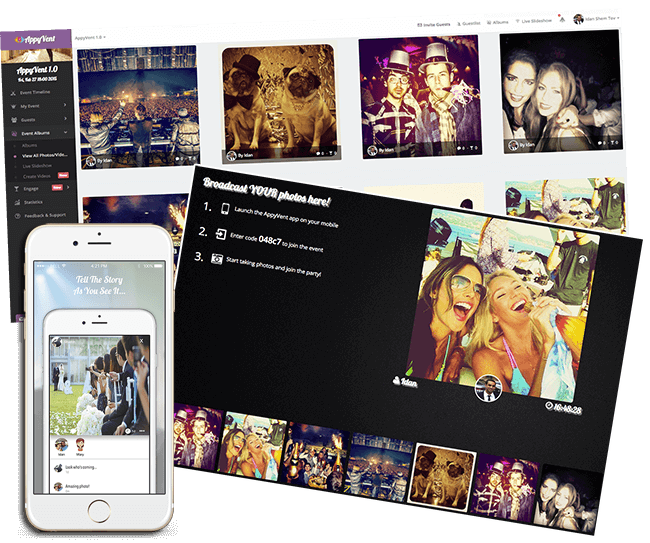 You can invite as many guests as you wish, upload as many photos you want and have your event app and website running for as long as you need. We believe in providing a unique, unforgettable experience for you and your guests and by limiting these things we will not be able to deliver our promise. How does AppyVent help my guests? 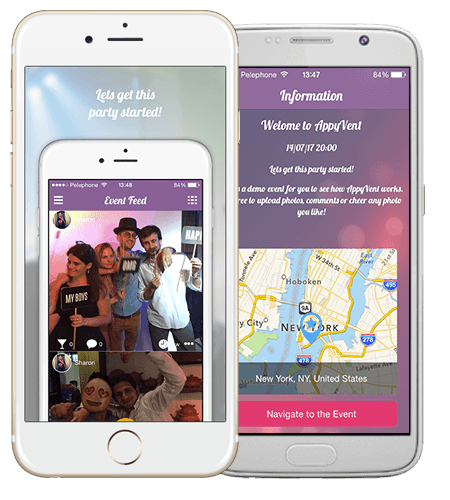 AppyVent provides your guests with a unique, unforgettable experience before, during and after your event. Guests can use your event app or website to RSVP and manage their RSVP, view important information, seating details, directions and upload photos they took at your event directly to your event albums. Every guest is now gets a VIP experience. Do guests need to download anything to their smartphones? We provide you with your own event website. Your event website is 100% responsive which means it will work beautifuly across all different devices. Guests can view event information, RSVP, map & directions, albums and more directly on your website. For the full experience tough, we definitely recommend your guests download your event app. How long does AppyVent keep my event for? All media is hosted for a year as a default. After a year and if your is no longer active (no user logs in) we will update you 3 times before we delete the event so you can extend your hosting. Paid events are hosted for as long as you wish! At any moment you can download all guest lists and media shared at your event. How can guests get started using AppyVent? It's fast and it's easy! Guests can begin using AppyVent and join your event from an invite you send them or just by downloading AppyVent and entering your event code (visible in your event dashboard). Guests without smartphones can also participate on the web.